A helicopter rises from behind the hills, fields of strawberries and broccoli stretching for miles into the distance. The pilot moves toward a specific target, then releases a foggy, wet dust from a 17-foot spray boom, carpeting the ground—and, more specifically, the plants growing there. Clouds of herbicide sink through the morning air, floating over a series of 34-foot-wide plots. The pilot has to occasionally return to refill the tank, each time landing with feather-light precision on top of the truck that carried in the helicopter. COLORS IN PERIL: The prickly phlox (Linanthus californicus) with its purple flowers is among 26 imperiled native plants that inhabit the Guadalupe-Nipomo Dunes National Wildlife Refuge. An ongoing experiment is testing the efficacy of an aerially sprayed herbicide to control veldt grass (Ehrharta calycina, seen growing in the middle of the landscape), an invasive species wreaking havoc on the dune scrub habitat. It’s a relatively common sight throughout the Santa Maria Valley, where flying craft are known to drop an assortment of pesticides and other chemicals on acres of crops grown in the fertile valley. But on March 18, the spraying wasn’t targeting fruits or vegetables; instead, the helicopter flew above the rugged, sandy dunes of the Guadalupe-Nipomo Dunes National Wildlife Refuge. Spraying from above is the latest strategy local agencies are exploring to manage veldt grass, an invasive weed wreaking havoc on the scrub habitat that covers much of the 2,553-acre refuge at the heart of an 18-mile-long coastal dunes complex. Veldt grass, often referred to as veldt, is native to South Africa. Since the time it was first introduced to California in the early 20th century, veldt has sprawled across much of the state’s coast. In some places—like Guadalupe and Montaña de Oro—it’s become one of the most formidable of all the invasive species being managed. In the dune scrub habitat—a place in constant flux as wind continuously forms and reshapes the dunes—veldt gained a foothold by colonizing the very open spaces and disturbed soils that native plants depend on. Veldt is so well established in the Guadalupe dunes that the agencies in charge of managing the area decided to escalate their eradication methods. That helicopter moving through the skies on March 18 applied two different herbicides as part of an experiment to test their efficacy for managing veldt. 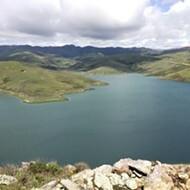 The Land Conservancy of San Luis Obispo County, which has been involved in wildland management in the area since 1984 and more actively managing invasive species since 1999, is overseeing the tests. Above them all is the U.S. Fish and Wildlife Service (USFWS), which owns the refuge, said Jon Hall, restoration manager for the Land Conservancy. The crux of the experiment: Can an aerially administered herbicide stop veldt in its tracks and create an opportunity for native plants to flourish without significantly impacting the native habitat everyone is trying to protect? According to the California Invasive Plant Council, which boasts an extensive online library of invasive plants, the South African-native veldt grass has been in California since the 1930s. Three different species of veldt, or Ehrharta, populate the state: E. calycina [Smith], E. erecta [Lam], and E. longiflora [Brey]; also known as perennial veldt grass, panic veldt grass, and annual veldt grass, respectively. Perennial veldt grass, (Ehrharta calycina) has moved into the Guadalupe-Nipomo Dunes National Wildlife Refuge and Montaña de Oro State Park, as well as several other locations throughout the coast, stretching south to areas around Vandenberg Air Force Base and the Gaviota coastal grassland terrace, and north to places like Bodega Bay in Sonoma County. Several people familiar with the grass, including Hall, say that perennial veldt was first introduced to this area in the 1940s by the U.S. Soil Conservation Service—now the National Resource Conservation Service—which promoted the grass to ranchers as both an excellent source of forage for their cattle and an effective tool for erosion control. 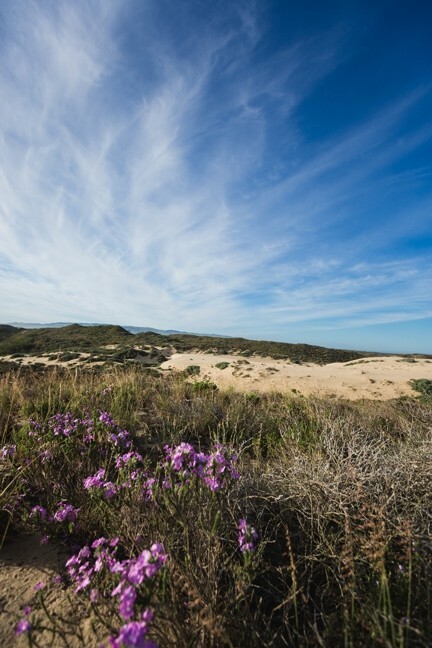 During that time, veldt was introduced to several areas within the Guadalupe dunes and planted on the Nipomo Mesa to be harvested for its seed; it became popular among ranchers and the then-prolific dairy operations. The qualities that made it so effective at that time—vigorous growth, a preference for disturbed soils, and the ability to harness wind to spread and sow seeds—are the very things that now make veldt such a challenge to manage. Veldt is still present in rangeland areas, but it’s difficult to easily identify because cattle continue to eat it, preventing the tall, slender, reddish-brown leaf ends and seeds from maturing. Locally, veldt is the biggest reminder of how humanity’s best intentions of yesteryear can transform into a steep, uphill battle for the present population. Restoration crews wrestle with a long list of stubborn plants and grasses that were once introduced for a variety of reasons, including erosion control, cattle forage, or as a beautiful addition to landscapes. At times, the goal in managing invasive species is limited to stopping a plant or insect from proliferating further. At other times, it’s about subduing it and giving the upper hand back to the native species. 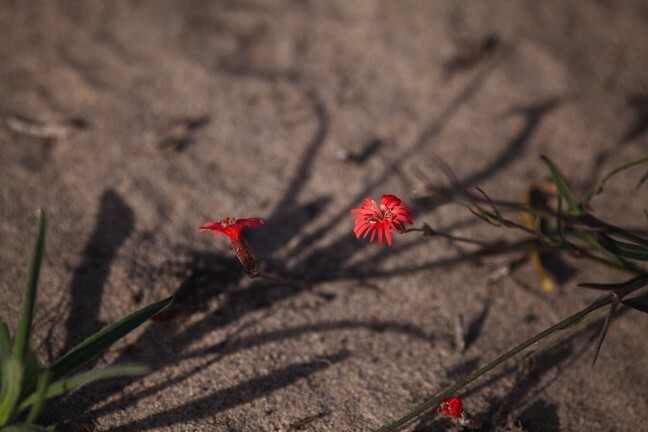 A COMPLEX ISSUE: Fringed India pink (Silene laciniata) is one of many plants native to the Guadalupe-Nipomo Dunes National Wildlife Refuge and the surrounding dune complex that may be threatened by the continued spread of invasive veldt grass. “The big idea in ecology is that we’re in the anthropocene now; we’re in this period where humans are altering the environment like crazy,” said John Chesnut, a Los Osos-based botanist who works extensively with native and non-native plants in the area. Several management efforts have been employed locally to control veldt: grazing, fire, hand pulling, and backpack sprayers. Management officials have also used biological forms of controlling veldt, in which the habitat is manipulated to enable native plants to outcompete. But it’s hard to keep up, especially in places where veldt has such an extensive foothold: the Guadalupe dunes. The dunes were particularly ripe for veldt’s colonization, because of the amount of disturbed soil in the area, Chesnut said. Grazing, recreation, and pipeline construction have disturbed the soil in several places, creating a tumult that breaks whatever natural equilibrium was present and opens the space to the highest bidder, so to speak. In other words, the most competitive species wins. The bottom line: Many people who are intimately familiar with the dunes are concerned that if they can’t get veldt under control, the plant will threaten many of the 144 imperiled, special-status plant and animal species: 26 taxa of plants and 118 taxa of invertebrates, amphibians, birds, reptiles, and mammals that are on some sort of list, including endangered or protected species, according to the USFWS environmental assessment. Much of the focus is on the plant life, which is more visibly affected by veldt and plays host to the plethora of creatures inhabiting the dunes. 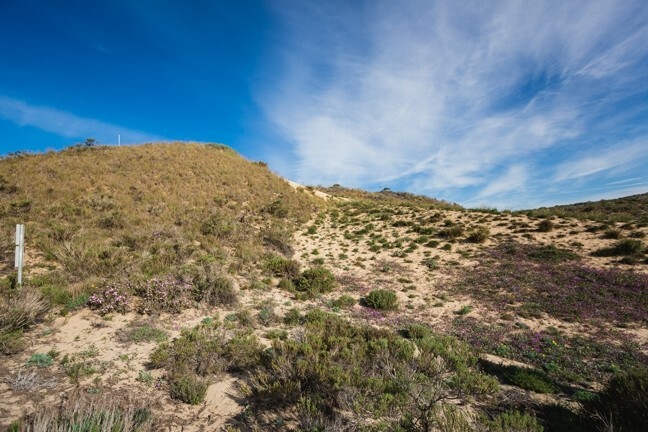 Scientists have identified a total of 216 plants on the dunes, and of the 26 plants listed as imperiled, several are smaller, annual flowering ones (which grow in the spring and then die back before winter) that rely on open sand between the larger bushes, which is exactly the area that veldt inhabits. It’s difficult to argue with that claim. A light rub of the leaves releases a pungent aroma, similar to mint and sage. Later that morning, while heading back after traipsing through the rugged, hilly dunes, that familiar smell returned as a leg brushed up against a small plant that stood only about a foot wide and a few inches off the ground. Other, more sturdy, larger, and shrubby perennial plants make up the foundation of the dunes, creating stability so the rest of the habitat can flourish, including the silver-bush lupine, coyote bush, and mock heather. Creatures big and small thrive in this mix, among them lizards, birds, bobcats, and deer—and the mountain lions that follow them in. Closer to the ocean, Oso Flaco Lake features some of the most impressive bird watching in the area. Wildlife depends on plant life, of course, and veldt is so well established that it’s prompting a lot of concern. With the help of Meyers’ trained eye, the foliage covering the hillsides became distinctly identifiable; the reddish-brown tips at the end of the bunchy veldt grass stood out from the lighter, bluish-green shaded silver dune lupine; the stocky, woody coyote bushes; and the rainbow of colorful flowers that popped out among them. Several hillsides are thoroughly colonized by veldt grass, and it’s difficult to distinguish it by anything other than the bunched, reddish-brown hues of its foliage. 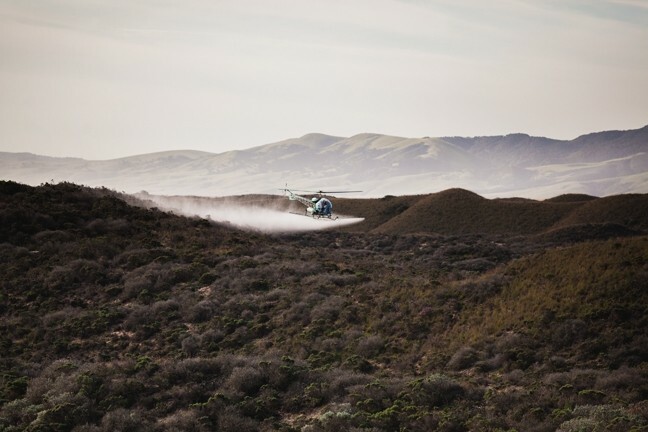 GRASS FIGHT: A helicopter recently circled above the Guadalupe-Nipomo National Wildlife Refuge, spraying an herbicide being tested to manage veldt grass, an invasive species that threatens to adversely impact the dune scrub habitat. In comes the helicopter-spraying experiment. Whenever land management is discussed, there’s bound to be an assortment of approaches and debates over what constitutes the best management practices. That’s especially true when herbicides and pesticides are involved. The subtle irony of testing an herbicide for wildland habitat management isn’t lost on the project managers. But with veldt on the rise even after decades of costly, labor-intensive management via backpack sprayers and hand removal, aerially sprayed herbicides seem practical. The environmental assessment, which has been reviewed and approved, detailed both the alternatives to spraying and the projected impacts. The assessment found the alternatives—many of which have already been employed and also bring their own set of impacts—to be insufficient. The use of heavy machinery to pull out the grass can be damaging to historical and cultural resources. Grazing has been associated with eutrophication (the over-enrichment of nutrients, which suffocates the life cycle) of ponds and wetlands; cattle hooves trample plants and may facilitate the movement of other invasive species; and the lack of fencing makes it unmanageable. Controlled burns would adversely impact air quality, and utility terrain vehicles would likely cause more harm than good in terms of impacts to the ground and wouldn’t be able to access much of the steep slopes inhabited by the veldt. As for backpack sprayers and hand pulling, those are the best techniques so far, but are very expensive and can’t keep up with the spread of veldt. Accessing veldt by foot requires a lot of hiking and hauling of materials, plus it costs about $300 per acre. Aerial spraying is estimated to cost about $30 per acre. INVASIVE: Veldt grass (on the hillside to the left) is colonizing open spaces in the dunes, essential places where native plant life can flourish. “That’s a huge cost savings when you are looking at managing weeds in a 22,000-acre dune system,” Hall wrote in an email, referring to the larger goal of adding aerial spray to the portfolio of management options to the greater dune system, not just the refuge. Currently, the Land Conservancy and the USFWS are testing an herbicide that isn’t presently approved for wildland application: Arrow 2EC, a clethodim used for weed management. The Land Conservancy believes the chemical, which specifically targets grasses, will be more effective than another chemical, a sethoxydim called Poast, which is approved for wildland application. The spraying, which began March 18 and is targeting the veldt while it goes to seed, is aimed at 10 separate 2-acre plots; five will receive one chemical, and another five will receive the other. Ten additional control plots will receive no treatment. The objective is to see if Arrow 2EC has more effect than Poast, and to assess how much impact there is to native plants. Additional measurements are assessing how much herbicide drift occurs, so they can create effective buffers between the areas being sprayed and wetlands and other sensitive areas. The environmental assessment outlines projected impacts as being rather minimal, claiming that the net impacts would be beneficial. The spray doesn’t affect most of the native plants, and there are few native grasses in the area. Only two of the 144 imperiled species will likely be impacted: the California legless lizard and the Morro blue butterfly. As for whether chemical application is the best or most popular management method may be a larger debate. The Pesticide Research Institute, a Berkeley-based organization that examines the effects of herbicides and pesticides, couldn’t be reached for comment. Chesnut, who’s worked extensively within the Dunes Complex, opted to not be involved with the aerial spraying experiment, but still recognized the project’s justification, as veldt is out of control. Referring to the “finish” aspect of the spraying, or the process in which the native plants rebound, Chesnut notes that in the long-term picture, the dune shrub plant community will need to be able to protect and manage itself. That transition from the removal of the existing veldt to a habitat that gets back into the natural cycle can be a puzzle. Chesnut considers the silver dune lupine to be a key in this process, because as a pioneer species, its heavy foliage can shade the soil and outcompete veldt while allowing for other native plants to flourish. He also sees a potential piece to the puzzle in a fungus currently being studied at Cal Poly, which infects veldt seeds. However, when it comes to biological management, things get very complicated. Hall is familiar with these points, and in many ways agrees with Chesnut. Those questions are: Is the aerial application of a grass-specific herbicide effective on veldt grass? What is the cost? What is the impact to natives? What size of buffer is necessary? Even if the experiment yields successful results, there’s a long road ahead, full of more permitting and complicated approaches to management. For now, funding exists only for this year. The presence of two little insects has triggered large precautionary measures from the people looking out for the local agricultural industry. 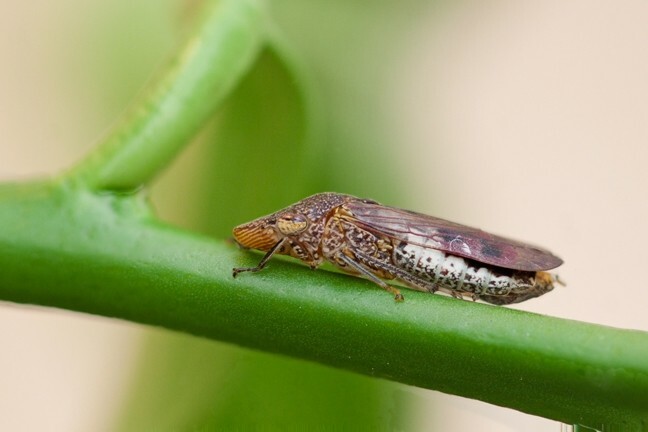 The glassy-winged sharpshooter (GWSS) and the Asian citrus psyllid act as vectors for disease, each spreading particular bacterium that can be deadly to fruit trees. PACKING A PUNCH: The glassy-winged sharpshooter is a vector for the bacterium that causes Pierce’s disease, which can be harmful to vineyards. The GWSS (Homalodisca vitripennis) was first discovered in SLO County in 2010, when a group of adults and nymphs were found on sticky paper traps in the Arbors development on Tank Farm Road near Islay Hill. 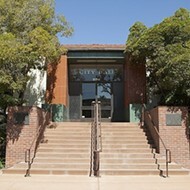 The SLO County Agriculture Commissioner’s office treated that detection seriously because the site was a little too close for comfort to Edna Valley’s rolling hills of vineyards just a mile away. (The Ag Commissioner’s office, it’s worth mentioning, takes all detections of invasive pests very seriously.) The insect is a vector for Xylella fastidiosa, a bacterium that causes disease in fruit trees. Namely, the bacterium can lead to Pierce’s disease in grapevines. 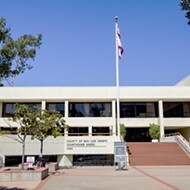 According to information from the University of California Riverside’s Department of Entomology—which has done exhaustive studies on invasive insects in California—damage related to the GWSS and Pierce’s disease caused an estimated $37.9 million in losses to Riverside and San Diego counties in 1998 and 1999. The insect is also considered responsible for several leaf scorches in other plants, including oleander leaf scorch, which has wreaked havoc on flowering bushes planted along 2,000 miles of roadside median strips, leaving an estimated $50 million in damage. Pierce’s disease isn’t necessarily an invasive disease. It’s endemic to Northern California, and was known to damage vineyards in the 1800s. The disease’s spread, however, remained minimal until the GWSS—native to the southeastern United States—was inadvertently brought to California in the 1990s. The GWSS is much larger and a much more voracious eater than the native sharpshooters, which means more potential for the disease to spread. While an individual insect may occasionally be discovered—one was detected in Arroyo Grande in February—the species is considered to be largely under control in this area. A more recent arrival may bring new anxieties, however. The Asian citrus psyllid (Diaphorina citri Kuwayama, also known as the ACP) is another source of disease that’s caused extensive damage. The pest is a vector for Huanglongbing (HLB), also known as citrus greening disease, which poses a threat to the nation’s citrus industry. In Florida, Huanglongbing has impacted nearly half of the citrus industry in the last decade, causing an estimated $1.3 billion and counting in damage and resulting in the loss of thousands of jobs. Only one tree affected by HLB has been found in California—an orange tree in a residential neighborhood in Los Angeles. The tree was subsequently destroyed. The concern, however, is that once the ACP establishes a network, destruction may be only a matter of time. The ACP, first discovered in San Diego and Imperial counties in 2008, was found in Santa Maria in 2012, then detected in Arroyo Grande in March 2014. Since then, two more detections have occurred in a neighborhood in Northern San Luis Obispo. Quarantines with a 5-mile radius have since been established. There are several invasive plants that have established themselves throughout San Luis Obispo County. Artichoke thistle and purple and yellow starthistle span roadsides and rangelands, pampas grass pops out of hillsides, and French broom sweeps through pine forests and coastal canyons. Each weed brings its own set of annoyances or prospective danger to the area it inhabits. 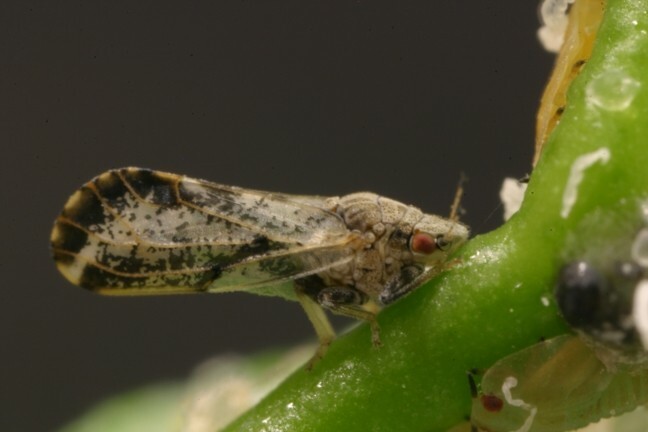 AN UNCIVIL PSYLLID: The Asian citrus psyllid, a recent arrival to the Central Coast, can transmit Huanglongbing, or citrus greening disease, which damages citrus trees. SLO County Deputy Agricultural Commissioner Marc Lea told New Times that it may not be possible to completely eradiate certain plants that are already established. Instead, weeds are approached with more of a management mentality, where existing populations are controlled while on-the-ground work focuses on preventing spread into new areas. The challenges have only been compounded by globalization and the time-space compression in travel and exchange. “People move around much quicker, and the things they bring around are much more vast,” Lea said. Many of the invasive weeds found in the area were at one point introduced intentionally—often for landscapes, erosion control, or as a renewable resource for building or other material uses. Locally, the county’s agricultural department and the Land Conservancy of San Luis Obispo County have culled San Luis Creek to remove Arundo donax, also known as giant cane. The plant grows vigorously in marsh-like and damp soils and has infested creeks in many places in California, where it chokes out native plants and can impact the hydrological conditions in riparian habitats. Arundo has been considered a fire danger, as much of the plant becomes dry and brittle after the growing season, producing masses of fuel; it was thought to have facilitated the spread of recent fires in Southern California. 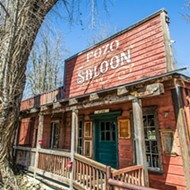 Arundo was introduced to California in the early 1800s, favored for its effectiveness as material for roofs and as fodder. The cane has also been used to make wooden flutes, and is still used to make reeds for woodwind instruments. Commercial plantations in California produce the cane for reeds. The plant’s usefulness hasn’t been lost to some locals. Jon Hall, restoration manager for the Land Conservancy, said that when the organization removed arundo from creeks in the area, workers often came across encampments inhabited by members of the area’s homeless population, who would clear out nooks in the arundo groves or use the canes to build shelter. 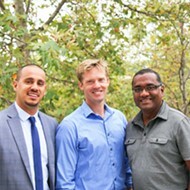 The process created an interesting community relations dimension to a program that was, at its root, intended to address the spread of otherwise unwanted plants.